In a surprise move, Elkhart Commissioners made the decision to stop using the term “County” effective immediately. “We need to further distinguish this area and we think people will surely take notice,” said elected official Suzanne Weirick. “Henceforth, it will be known as Elkhartshire.” As part of the edict, municipalities and townships will refer to themselves using names like Goshen of Elkhartshire, Nappanee of Elkhartshire and, of course, Elkhart of Elkhartshire. In a related move, the title of County Commissioner has been changed. Those who hold the office shall be called Vassals. “These new designations will help everyone see how unique Elkhartshire is,” stated Vassal Weirick. “It’s about time,” Vassal Mike Yoder added. In a nod to the times, the Vassals appointed Sir Jester of Elkhart as the shire’s Head Fool. “I am honored,” Sir Jester said. “It’s about time,” Vassal Mike Yoder added. 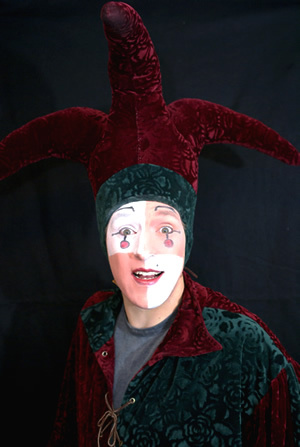 Sir Jester is one of four characters created by local clown Neil Crum. It is timely to honor Neil on a day that is so sacred to him. Neil says he gets his comic leanings from his mother and her sisters, his aunts. One aunt performs as a clown. All are characters. Family reunions are more like a talent show. Performing in front of the family is encouraged. It was at an acting camp when Neil was a kid that he caught the bug. He knew then that being a clown was right for him. As an adult he has attended clown college to hone his skills. His characters include a hobo and a mime. Wiggleston is Neil’s most popular persona. Dressed in a wide-checked tuxedo with tiny top hat, Wiggleston is a clown magician, but he has not quite mastered his tricks. Fortunately, bad magic makes for good humor and big laughs. Neil came to Elkhart about 20 years ago. He likes the natural environment and especially enjoys the rivers. His children are also in Elkhart. Here’s a toast to our Vibrant Fool. Let’s celebrate today as Sir Jester would want us to: With a wink and a nod and just a little mischief.